Black Mirror is one of the best anthology science fiction television TV series on air (on Netflix) right now. I just LOVE it. Now thanks to UK Guardian, we get to look deep inside Black Mirror with insights from co-creators, awesome master class with Charlie Brooker and Annabel Jones! Nov 5th, 2018 Correction: While I wish Charlie and Annabel are co-creators, I should correct and state that they are co-show runners while is Charlie the creator of Black Mirror according to the book info of Inside Black Mirror (available Nov 20 2018) they are plugging. Charlie Brooker is an award-winning writer, producer and broadcaster whose career has spanned television, radio, print, and online media. Brooker is the creator and writer of Black Mirror, whose fourth season launched on Netflix at the end of 2017 and won a BAFTA Craft Award and has recently picked up three BAFTA TV Awards nominations. The critically acclaimed, mind-bending anthology series originally launched on Channel 4 in 2011 and over its four seasons has collected awards including Primetime Emmys® for Outstanding TV Movie and Outstanding Writing for a TV Movie, Producers Guild of America, Rose D’or, BAFTA, International Emmy® and Peabody. Annabel Jones is a long-term collaborator of Charlie Brooker’s. She serves as co-show runner and executive producer on Black Mirror. Previously Jones executive produced a number of shows presented by Charlie Brooker including three series of the BAFTA-nominated BBC Two satirical review Weekly Wipe; all seven editions of the annual shindig Charlie Brooker’s End of Year Wipe, which won a BAFTA for its 2016 edition; How Video Games Changed the World; Newswipe, which won the 2009 Royal Television Society Award for Best Entertainment Programme; Gameswipe; and the How TV Ruined Your Life series for BBC Two. Amy & Rory introduce 13th Doctor – Jodie Whittaker! Wonderful Doctor Who news! I created a video of Amy & Rory introduce 13th Doctor – Jodie Whittaker! Enjoy! 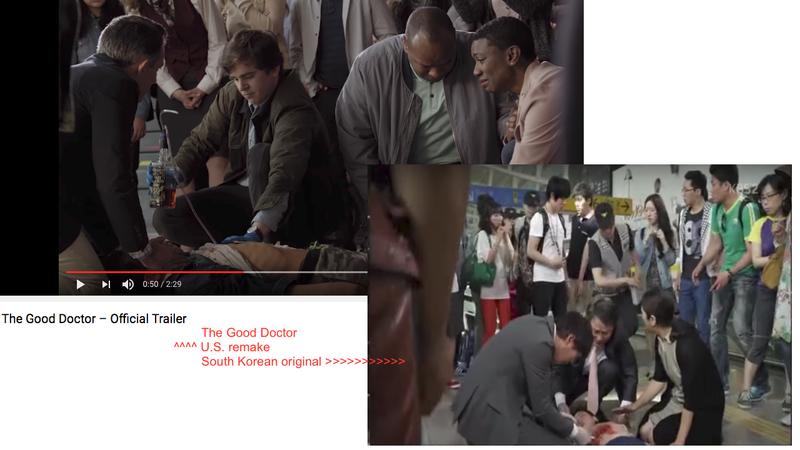 I’m looking forward to watch The Good Doctor, an upcoming American medical–drama television series, developed by David Shore (creator of House and U of Toronto law grad) and Daniel Dae Kim, starring Freddie Highmore, based on the 2013 South Korean series of the same name. See below for trailers of both series. I’ve watched the first few episodes of the South Korean series and found it fascinating but also recognize there needs to be lots of changes in this remake to turn it something more to the taste of North American audiences. There are a lot of screen time spent on hospital politics in the South Korean series that it endanger patients so much that will be rather unbelievable. Shore created a great in House and I expect and hope he and his team would be able to create something interesting to watch with his own creativity and sensibility. “The Good Doctor centers on Shaun Murphy (Highmore), a young surgeon with autism and savant syndrome who relocates from a quiet country life to join a prestigious hospital’s surgical unit. Alone in the world and unable to personally connect with those around him, Shaun uses his extraordinary medical gifts to save lives and challenge the skepticism of his colleagues. “Written by Shore based on a South Korean format, The Good Doctor centers on a young surgeon with Savant syndrome who is recruited into the pediatric surgical unit of a prestigious hospital. The question will arise: Can a person who doesn’t have the ability to relate to people actually save their lives? Shore executive produces via his Sony TV-based Shore Z alongside Kim, Sebastian Lee & David Kim. Shore Z’s Erin Gunn co-executive produces, along with Lindsay Goffman of Daniel Dae Kim’s 3 AD. Here is a trailer of the ABC series. Handmaid’s Tale by Margaret Atwood is now a Hulu TV Series. This is especially chilling in our horrific age of President Trump. Love the Kevin Kwan (iG) novel “Crazy Rich Asians“. So I’m really looking forward to watch the movie (to be directed by Jon M. Chu (twitter)) starring Constance Wu (Rachel Chu, THR report), Gemma Chan (Astrid via Variety, LOVE Gemma in Humans). @henrygolding (imdb) is playing Nick Young (via Kevin). Black Mirror season 3 created by Charlie Brooker is now on Netflix and it is a must see speculative fiction (or if you wish, Sci-Fi) show! Two of my favourite S3 episodes are “San Junipero” and “Hated in the Nation” (WARNING: those linked pages have spoilers). Sarah Rafferty’s Donna in TV series Suits is as good as my mom! To me, Sarah Rafferty‘s Donna in the TV series Suits personify the best of the best Executive Assistant! The passable Executive Assistant does what you want after asking for your clarifications and help. The OK Executive Assistant does what you ask competently without bugging you too much. The best of the best Executive Assistant knows what needs to be done before you ask and do it so well that you realize he/she has saved you so much time so you can focus on other important matters! FOX 11 Google+ Hangout: Sarah Rafferty Talks Suits (timecode 5m25s) <== This links jump right to my question for Sarah, who plays the super executive assistant to the lead lawyer Harvey in #suits ! To me, my mom is one of the most #awesome executive assistant I know of! You ask how good? Well, after the first few years of a manager running the office with her help, the HQ decided to eliminate the manager position and have her run the office without a manager for the following decades! I’ve learned so much from my mom! LOVE you mom! Thanks +Maria Quiban +Tony McEwing +Tshaka Armstrong at +FOX 11 Los Angeles for the awesome experience!